It can be challenging to come up with innovative offerings in the dog walking & pet sitting world but my small business did it and Chauncey’s all about it. We created this super fun Birthday Box that our families are LOVING. While you’re at work, we’ll pick up your dog’s birthday cake, provide “mind-blowing” decorations (have you ever seen a dog with a balloon? ), and add party favors for the whole family to enjoy. You just add your dog and you’ll have an instant celebration. 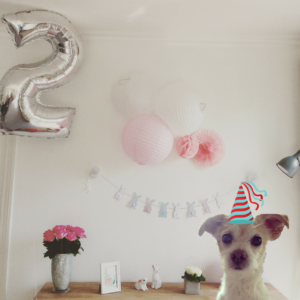 Hoomans sellabrate their birthday on not just the givin day but soomtimes they sellabrate 4 entire weakends. i’m not trying 2 get anyone 2 agree 2 go 2 tapas w/ and then do Whirlyball after. I just want a birthday in a box that sellabrates my birth. Let our team provide you with an instant celebration for your special pup, hand-delivered to your door. Birthday in a box includes a freshly baked pup cake of your choosing, dog-friendly party favors for four, and a small arrangement of balloons. All that’s needed is your dog! 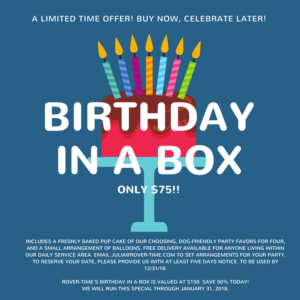 Valued at $150, we are offering our Birthday in Box package at a discounted rate of $75 between now and 12/31/17. This offer is good for one party between 1/2/18 and 12/31/18. Free delivery for anyone living within our daily service area. To begin your order, fill out this form and we’ll be in touch via email to get the party started!